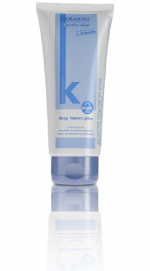 Adds natural keratin to the hair for natural hydration and glossy hair right from the very first application. For instant,extreme softness. An important part of the Keratin shot smoothing treatment as well as the Absolut permanent straightening system. Makes the hair rebuilding effects of both treatments last even longer. Natural hydrolyzed keratin: guarantees the total preservation of the hair structure’s resistant qualities for maximum structural protection. Shea butter: provides elements that conserve the hair’s lipidic barrier thanks to oily properties which protect the hair fiber. Extremely fruity top notes dominated by citric scents blended with a gentle touch of strawberry and rose with a base of balsam,vanilla and chocolate. Apply the mask evenly all over clean damp hair and leave on to work for three minutes. Then rinse off with plenty of warm water.